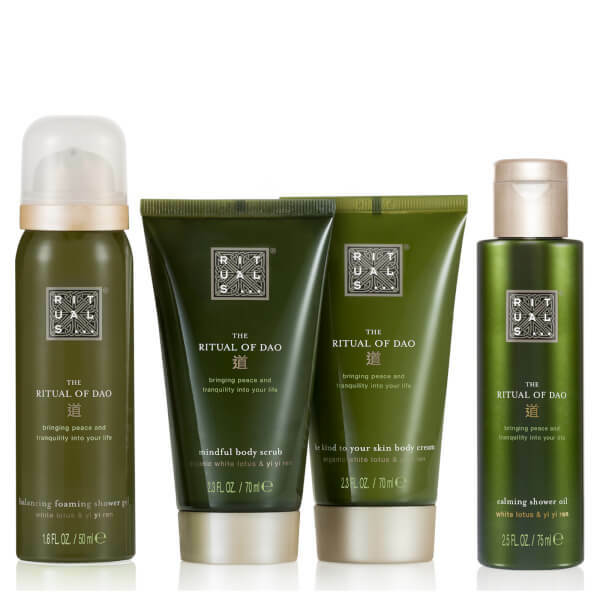 Rituals present The Ritual of Dao Calming Treat Gift Set; a luxurious body collection that combines four of the brand's favourite formulas to rebalance and restore. 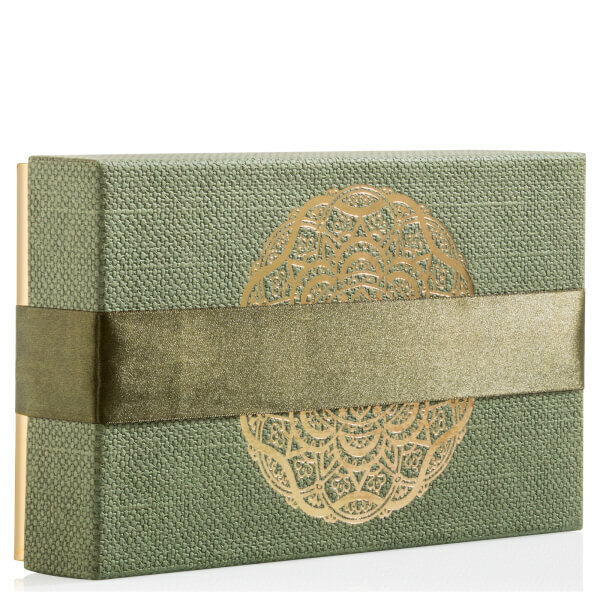 Housed in a gift box. Transforming into a rich foam on contact with water, the refreshing shower gel delicately lifts away impurities whilst nourishing and moisturising the body. Enriched with organic Yi Yi Ren and White Lotus, skin feels revitalised, soft and supple with a subtle fragrance. A calming shower oil dedicated to comforting and hydrating the body. Utilising an ancient Chinese philosophy that helps one achieve perfect harmony, the oil harnesses the organic power of Yi Yi Ren, an ingredient traditionally used in Chinese medicine, and White Lotus; it transforms into a luxurious, silky soft foam on contact with water to intensely nourish and soften. Expect incredibly supple skin infused with a relaxing fragrance. Infused with ultra-fine Chinese Bamboo particles, the rich formula gently buffs away impurities and dead skin cells without over-drying the body. Delivers a relaxing fragrance of White Lotus and Yi Yi Ren extract to leave skin calm, comfortable and silky soft. Ideal for weekly use, the body will be super smooth, hydrated and nourished. A lightweight, quick-absorbing formula with a delicate fragrance of White Lotus. Harnessing the powers of Shea Butter, Centella Asiatica and Yi Yi Ren (an ingredient traditionally used in Chinese medicine), the rich, creamy moisturiser softens and conditions skin without greasy or sticky residue. Expect smooth, supple and comfortable skin from top to toe. Foaming Shower Gel: Apply a small amount of foam to the palm of your hand. As soon as the gel comes into contact with water, it changes into a rich nourishing foam for cleaning the whole body. Shower Oil: Apply the oil on dampened skin and massage with a rotating movement until it transforms into a silky soft foam, then rinse off with luke warm water. Body Scrub: Massage into damp skin with circular movements, then rinse with warm water. Body Cream: Apply daily and massage into the whole body. Foaming Shower Gel: Aqua/Water, Sodium Laureth Sulfate, Cocamidopropyl Betaine, Isopentane, Sorbitol, Peg-120 Methyl Glucose Dioleate, Isopropyl Palmitate, Parfum/Fragrance, Isobutane, Coix Lacryma-Jobi Ma-Yuen Seed Extract, Nelumbo Nucifera (Lotus) Flower Extract, Sodium Benzoate, Peg-40 Hydrogenated Castor Oil, Citric Acid, Benzyl Salicylate, Guar Hydroxypropyltrimonium Chloride, Butylphenyl Methylpropional, Hexyl Cinnamal, Benzyl Benzoate, Caprylic/Capric Triglyceride, Linalool, Glycerin, Benzyl Alcohol, Alpha-Isomethyl Ionone. Shower Oil: Glycine Soja (Soy) Oil, Mipa-Laureth Sulfate, Laureth-3, Caprylic/Capric Triglyceride, Ricinus Communis (Castor) Seed Oil, Parfum/Fragrance, Propylene Glycol, Laureth-7 Citrate, Laureth-4, Cocamide Mipa, Soy Acid, Coix Lacryma-Jobi Ma-Yuen (Job’s Tear) Seed Extract, Nelumbo Nucifera (Lotus) Flower Extract, Helianthus Annuus (Sunflower) Seed Oil, Tocopherol, Caprylic Acid, Capric Acid, Glycerin, Methylpropanediol, Aqua/Water, Lauric Acid, Hydrogenated Palm Glycerides Citrate, Lauryl Alcohol Diphosphonic Acid, Benzyl Salicylate, Butylphenyl Methylpropional, Hexyl Cinnamal, Linalool, Alpha-Isomethyl Ionone. Body Scrub: Aqua/Water, Cetearyl Alcohol, Hydrated Silica, Kaolin, Glycerin, Stearic Acid, Caprylic/Capric Triglyceride, Butyrospermum Parkii (Shea) Butter, Parfum/Fragrance, Cocos Nucifera (Coconut) Oil, Bisabolol, Nelumbo Nucifera Flower Extract, Coix Lachryma Jobi Extract/Coix Lacryma-Jobi Ma-Yuen Seed Extract, Bambusa Arundinacea (Stem) Extract, Xanthan Gum, Disodium Edta, Sodium Cetearyl Sulfate, Tetrasodium Pyrophosphate, Sodium Stearoyl Glutamate, Sodium Stearoyl Lactylate, Polyacrylamide, C13-14 Isoparaffin, Laureth-7, Sodium Chloride, Sodium Sulfate, Ethylhexylglycerin, Tocopherol, Benzyl Alcohol, Benzyl Benzoate, Benzyl Salicylate, Hexyl Cinnamal, Linalool, Butylphenyl Methylpropional, Alpha- Isomethyl Ionone, Sodium Benzoate, Potassium Sorbate, Phenoxyethanol, Citric Acid, Ci 42090/Blue 1. Body Cream: Aqua/Water, Cyclopentasiloxane, Cetearyl Alcohol, Glycerin, Dicaprylyl Ether, Dimethicone, Butyrospermum Parkii (Shea) Butter, Pentaerythrityl Distearate, Helianthus Annuus (Sunflower) Hybrid Oil, Isopropyl Palmitate, Tocopheryl Acetate, Tocopherol, Sodium Hydroxide, Butylene Glycol, Ubiquinone, Centella Asiatica Leaf Extract, Coix Lacryma- Jobi (Ma-Yuen) Seed Extract, Nelumbo Nucifera Flower Extract, Theobroma Cacao (Cocoa) Seed Butter, Caprylic/Capric Triglyceride, Olus Oil (Vegetable Oil), Helianthus Annuus (Sunflower) Seed Oil, Parfum/Fragrance, Sodium Stearoyl Glutamate, Acrylates/C10-30 Alkyl Acrylate Crosspolymer, Xanthan Gum, Polyglyceryl-2 Dipolyhydroxystearate, Phenoxyethanol, Caprylyl Glycol, Potassium Sorbate, Benzyl Alcohol, Benzyl Salicylate, Butylphenyl Methylpropional, Hexyl Cinnamal, Linalool, Alpha-Isomethyl Ionone.